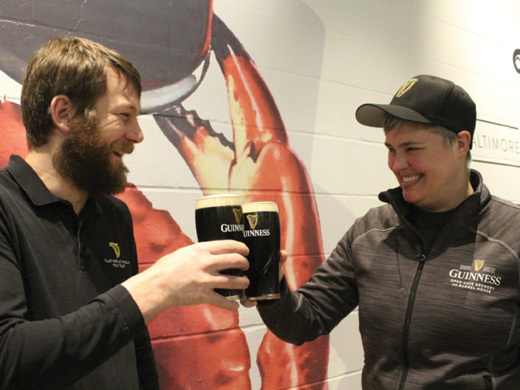 Guinness, the most famous of Irish brew masters, has taken notice of the brewing movement in the U.S., where Americans all over the country are brewing and creating beer labels with much success, and decided it would like to get in on the action. The Guinness Open Gate Brewery & Barrel House, opened on August 3, is just 10 miles from downtown Baltimore. The distillery, originally called the Maryland Distilling Company, was the first distillery opened after Prohibition in Maryland in 1933. It is the first Guinness brewery in the U.S. in 63 years (the company briefly had a plant in Long Island, New York from 1949-1954), and it is already a hit with Guinness fans. St. Patrick’s Day celebrations at the test taproom. The site is 62 acres in size and it has a long history, integral to the local area. Just off the Civil War trail, it has a protected pre-Civil War graveyard on its grounds.